NEW: Different kinds of slugs in pictures: The slugs described on this homepage. 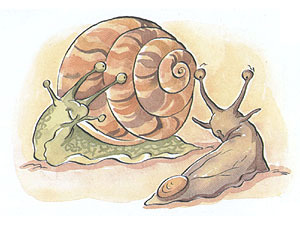 Snails without a shell are generally referred to as slugs. But the reduction of an exterior shell not only happens among land snails. In the sea you might find the colourful nudibranchs – them as well survive without a shell. After rain you may often meet the large black slugs (Arion ater), many of their smaller relatives crawling around in the bushes, and, alas, also in the gardens. What is the advantage, that made loosing protection by their shell a feasible option for those gastropods? Today, a gradual reduction of the shell may be seen among several contemporary snail families. Glass snails (Vitrinidae), for example, are called that way, because their shell has only a thin wall translucent like glass. There are different grades of shell reduction among the species of that family. 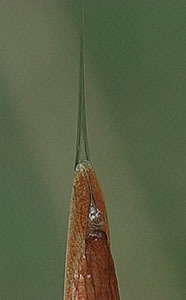 One is common to all of them: A large mantle flap covers the shell spire from the front. Some glass snail species have a shell, whose spire is diminutive, the last whorl, in contrary oversize and widened. A further reduction of the shell following that tendency would be the mantle fold overgrowing all of the further diminished shell. This state may be found among slugs of the Limacidae and Milacidae families. Both have got a rudimentary shell below the mantle shield. Slugs from the Arionidae family, in contrary, only have some calcareous grains left over from their ancestors' shells. A strong shell reduction has also happened during the evolution of different predatory snail groups. One of them, the Daudebardias (Daudebardiinae), for example, are a family of predator snails living underground and hunting earthworms, that are caught with the radula and swallowed whole. Life underground made necessary the reduction of the cumbersome shell. Which, as a result, leaves the Daudebardiinae with only the meagre rest of a glassy shell carried at the tip of the tail. A similar thing happened to snails of the Testacellidae family during their evolution. Testacellidae are only distantly related to the Daudebardiinae, though they also live and hunt underground. Comparing different slug groups arises quickly the question, how those shell-less snails could survive, without the protection of a shell. Snails' shells serve as a means of protection against desiccation and against enemies, though there are many animals that can easily destroy a snail's shell. The external protection of a slug mainly happens by its mucus or slime. Slugs' slime is specially sticky and hygroscopic, meaning it draws water rather than releasing it. Additionally it tastes really disgusting, as the German poet Hermann Löns discovered in a particularly remarkable self-inflicted experiment. Besides, slugs, when attacked, will contract their body and so make it very difficult for many animals to eat them. A slug (Arionidae) descends by a slime thread. Right: Close-up view. Some slug species not only use their slime for protection, but also for mating. Some slugs' (for example the leopard slug, Limax maximus) mating appears almost artistic, including descending from a branch or mushroom and mating in free air. 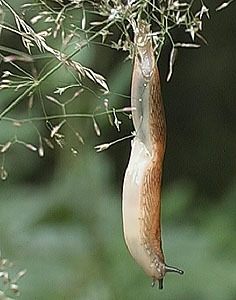 Other slugs also descend on their slime thread to reach lower branches or the ground. They can cover remarkable distances that way, as the picture in the right shows. Many slugs do not hibernate, as snails do, but die in the autumn, after laying their eggs. Those however survive the winter frosts and the next spring will bring new freshly hatched young slugs. Other slugs endure winter deeply dug into the ground, below the level of freezing. Most large slug species will eat almost everything. They can be found in salad, but also eating dead earthworms and other dead invertebrates, even their own kind. Forest dwelling species, such as the great black keel back slug (Limax cinereoniger) specially like eating mushrooms, leaving behind the traces of their rasp tongue. Some slugs are omnivorous and even eat other snails. 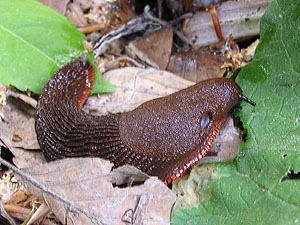 There are slug species almost everywhere, especially in forests, bushes and gardens. In Europe there are the large species of the Arionidae and Limacidae families, the largest of which, Limax cinereoniger, may well exceed 20 cm (8 in.) overall body length. 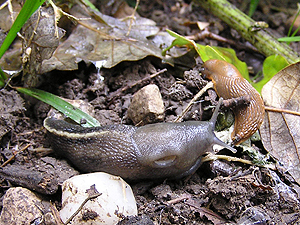 Smaller relatives are the field slugs (Ariolimacidae) and the keel slugs (Milacidae). Garden pests especially are the Durham slug or Lusitanian slug (Arion vulgaris) invaded from the Iberian Peninsula, as well as the garden slug (Arion hortensis), as well as several smaller slug species (Deroceras reticulatum, the netted slug). Well known American slugs are the banana slug (Ariolimax columbianus), mascot to the University of California in Santa Cruz (well known from John Travolta's t-shirt in the movie Pulp Fiction) and the Florida leather-leaf (Leidyula floridana). In addition to that several European species, among those the most harmful, have been introduced to Northern America, resulting in large problems to local agriculture. Northeast Florida Slug Page: Jacksonville Shell Club. Slugs - A Guide to the Invasive and Native Fauna of California (University of California, 2009) (PDF, 1,5 MB). BBC: Guide to Nottinghamshire Slugs.